Between work, school, sports and the crazy schedule that goes hand in hand with modern-day parenting, it’s more important than ever to slow down and enjoy time together as a family. 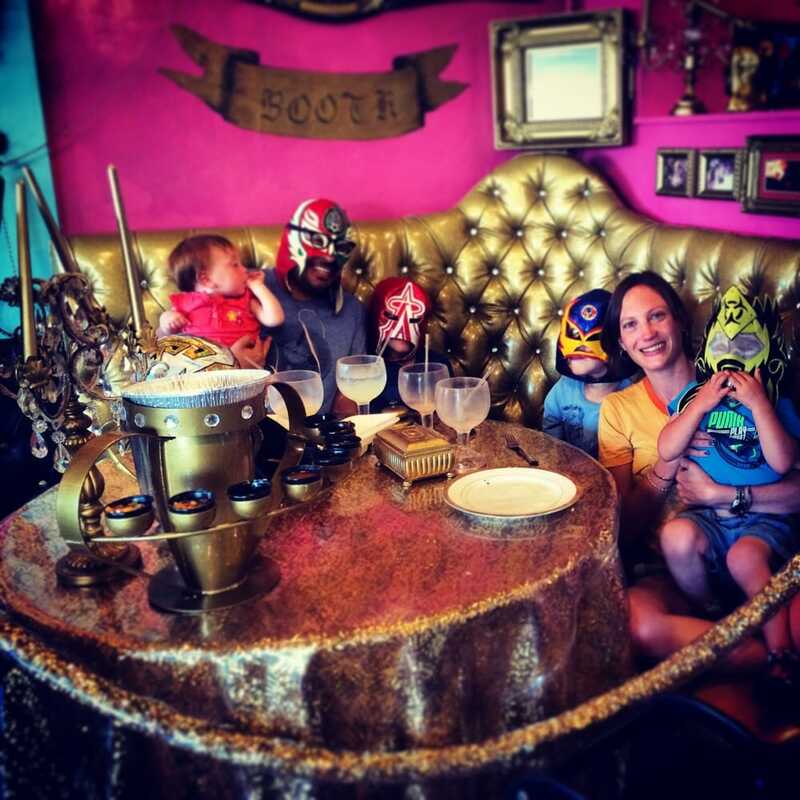 We’ve rounded up super spots all over the city where you can eat, play, relax and connect with your clan. Scroll down to see where to pencil in a family date! North County families will rejoice that the delightful outdoor shopping center One Paseo has begun opening several retail stores and restaurants. This inviting space welcomes families with plenty of grassy areas to lounge and play, a ping-pong table, and a giant tree log structure kids love to climb! Among the stores now open is beloved ice cream sensation Salt & Straw. The traditional family outing to get ice cream is truly taken to new heights with a visit to Salt & Straw. Their elevated take on ice cream flavors will please kids and adults alike. Classic flavors include Salted, Malted Chocolate Chip Cookie Dough and Peanut Butter Stout with Chocolate Chicharrón featuring Belching Beaver Brewery’s peanut butter milk stout. Vegans and those who don't consume dairy will love that the menu at this location is 20% plant-based with mouthwatering flavors including Freckled Mint Tcho-colate Chip, Dandelion Hazelnut Cookies & Cream and Roasted Strawberry Coconut. All flavors are handmade in small batches using organic, sustainable and thoughtfully-sourced ingredients such as cream from Scott Brothers Dairy, a family-owned Southern California farm. A visit to Salt & Straw always offers a fresh experience as they create new, limited-edition flavors monthly. For instance, examples of March flavors are Pots of Gold & Rainbows and Wild-Foraged Berry Slab Pie. Read our review of Salt & Straw's Little Italy location here. Park 101 is a unique multi-level, plaza-style complex located in the heart of Carlsbad Village perfect for dining, lounging and sipping. The family-friendly, 8000-sq. ft. establishment has open-air seating, cozy fire pits and multiple concepts, from a coffee shop to a bar, within the space. Kids can keep busy playing with life-size Connect Four, Giant JANGA or corn hole, while parents sip watermelon mimosas and catch a few rays. After they finish their meal, children can exchange their “token”, which they are handed when ordering, for free cotton candy! And on Wednesday’s, Park 101 invites the neighbors to join them for family-friendly movie night and complimentary popcorn. Don't forget to BYOB (bring your own blanket)! The California-style menu features fresh salads, grilled and BBQ meats, healthy smoothies and kid-friendly options. Food halls keep popping up all over the city! They're the perfect place to enjoy a bite to eat because there's an array of delectable options that will please every palate. No more trying to agree on which cuisine to chow down on as a fam because food halls give diners the ability to pick and choose between everything from tacos to Thai food and BBQ to pizza. Read our story on the best food halls open in San Diego now and which food halls are currently in development. Newish to the scene at UTC Mall, Tocaya Organica serves up modern organic Mexican food, including vegan, vegetarian and gluten-free dishes. Swing on in for the laid-back environment, comfortable seating options and expansive patios. Tocaya can accommodate any type of group. It's the perfect middle ground: not unhealthy fast food but not a stuffy dining experience, just a quality, fresh casual destination designed for all ages! After you get your fill of tacos and burritos, stroll around UTC Mall for some window-shopping as a fam. Take the fam out for gourmet fried chicken and fluffy biscuits! In fact, it's fun to meet up with another fam, because this hot spot is entertaining for everyone. Pint-sized eaters can have the nuggets and fries (plus, they come with a juice box and cookie). Meanwhile, we recommend the Firebird chicken for the grown-ups. Still more, you'll find a full bar and little chicks love the sandbox filled with toys. And sometimes Mr. Chicken himself shows up! Insider Tip: They have dairy and gluten-free items on the menu, just ask the server when you order. For one thing, space to move around helps family date night run smoothly. Eating outdoors among expansive gardens and grass is a great way to dine. For a start, it allows kids to run and explore their surroundings, while you relax with an appetizer. Then, at dinner, everyone's ready to talk. Even more, kids eat healthily with items like salmon teriyaki and grilled chicken. And, for grown-ups the baby back ribs and craft brew score points. Insider Tip: If you live in South San Diego, there's a Liberty Station location that's great too. With poodle skirts, pinball machines and a lively arcade, you'll find this a perfect family date night spot. Not only are the shakes scrumptious, but your kids will also enjoy their crazy straw hair and the fun fifties tunes. On one hand, swing in for a mid-day frosty treat or on the other, cruise the dinner scene. Make sure to save a few dollars for the awesome arcade! Insider Tip: Score a hole-in-one at the outside putting green after splitting a milkshake with your dates. You'll find plenty of families having date night here and there's a good reason why. You'll be spoiled for choice of food from lobster rolls and Thai to a stuffed burger and a gourmet popcorn store to top it all off. The outdoor seating (think fake grass and tables) makes dining al fresco fun––and dogs are allowed too (on the patio). Even more, you get to park for free and take a nice stroll after dinner. Insider Tip: If possible, a weeknight or early dinner date night is better if you want to avoid crowds. Dine out at this spot that's boisterous and cool. Not to mention, well known for our faves the Surfin' California burrito and Knockout fries. Good to know that it gets busy so visiting during off hours is more enjoyable. The chips and salsa are sure to open up your fam to talk time. Plus, the cool decor is a definite conversation starter. Inside Tip: It's worth it to book the champions table. (Online the day before). You'll pass up the line and eat at the gold table with cool accessories. From drive-in theaters to luxury cinemas and family flashback films to the newest blockbusters, seeing a movie as a family is a super fun outing for film fans. We've rounded-up the best movie theaters in the city so all you have to do is decide what you want to see and bring your appetite for popcorn! Click here for our list. A nice family day in La Jolla is always a good thing. A walk from La Jolla Shores beach (and playground) you'll find the Cheese Shop's scrumptious sandwiches and retro candy. Order up, then eat outside on the patio. Also, good to know that hamburgers and pizza options are nearby for littles who aren't into sandwiches. Insider Tip: Treat yourselves to one of their freshly made "world famous flourless oatmeal cookies." Truly, a nice morning family date spot. Walk (or run) among the creative sculptures and quirky snakes created by Niki de Saint Phalle. Even more, littles love the maze entryway. If you go on the second Saturday of the month, you'll find a docent who's full of facts about the artwork. Insider Tip: This is a great spot for a family photo.